Condominium living isn't for every bird, but purple martins like it just fine. Our largest swallows, these dark purplish-blue winged acrobats will return to the same multi-unit nesting structure year after year. Colonies of purple martins originally nested in natural cavities like tall dead trees full of woodpecker holes. They were first enticed into human-made nesting structures by North American Indians, who would hang clusters of hollowed-out gourds, or calabashes, from trees and enjoy the benefits of having these insect-eating birds in their midst. Nowadays, purple martins have adapted so well to living in artificial structures that they rarely bother to nest in hollow trees. Thanks to their graceful flight, rich chirruping, gentle manner, and healthy appetite for bugs, building a home for these birds can be one of the most rewarding backyard habitat projects of all. A purple martin dwelling will more likely be occupied if it's placed in an area where the birds already live. It should be located out in the open - at least 9 m away from trees - so the martins can swoop down to the entrance holes from all sides. Dwellings placed near open water may have extra appeal. New homes may not be occupied by purple martins right away, but don't give up too soon! • Use 2 cm plywood for the inside partitions and outside walls of the structure. Use 1.3 cm plywood for the roof and floor sections. • See Diagram I for a breakdown of the basic components and measurements of a three-level dwelling. • Cut four of section A to make a roof and three floors. Cut six each of sections B, C, and E for the walls and partitions. Cut three of section D.
• Drill a few small ventilation holes near the upper edge of each B piece. • Cut two 5.5-cm-diameter entrance holes in each C piece. The holes should be 2.5 cm from the bottom edge. One hole should be about 5 cm from the left edge, and the other 5 cm from the right. • Diagram II shows how to put the structure together. Use screws instead of nails to make it easier to correct mistakes. 4 cm coated flathead screws are best, as they will allow you to open the nesting box for maintenance in the fall. Assemble each level separately, beginning with sections B and C, as shown in Figure 1. • Next, put the inside partitions together by screwing one section E on either side of section D, as shown in Figure 2. • Screw these inner partitions to the outside walls, as in Figure 3. • Screw the unit to a floor section to complete one level of the structure. Assemble the other two levels, stacking and joining them with screws, as in Figure 4. Finish with the roof. • Paint the house white, but only on the outside. • Finally, mount the house on a 4.2 m cedar post set 1.2 m deep in the ground. Secure the base by pouring concrete into the hole before dropping the post into place. Anchor the structure to the top of the post with iron angle brackets. Alternatively, you can screw a large pipe flange on to the bottom and mount the structure on a galvanized pipe 3 m above the ground. • Be sure to cover the entrances or delay putting up the structure until martins are seen in the spring. Otherwise, sparrows or starlings may take over the dwelling. • You can discourage unwanted visitors by putting a guard, such as a tin collar, around the post. 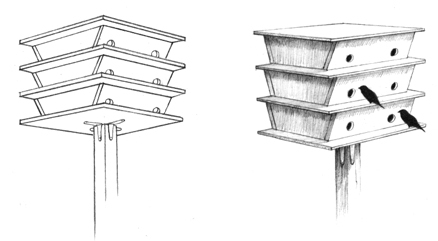 • Clean your purple martin house at the end of each nesting season. See the instructions for cleaning under the "Maintenance" section in "Build and Maintain Nesting Boxes". • Check on a regular basis that the structure is securely mounted and in good repair. • As the martin colony grows over time, additional storeys may be added to this multi-unit dwelling.